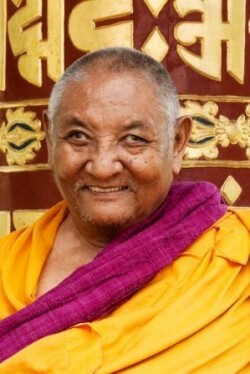 Khensur Jampa Tegchok, April 2010. Photo by Agostino Fabio. Ven. Lobsang Drolma recently sat down with Khensur Jampa Tegchok of Istituto Lama Tzong Khapa and asked a few questions about his work teachings Westerners. What followed was a touching and insightful exchange. Ven. Drolma: Geshe-la, how do you see us Westerners? Khensur Jampa Tegchok: There are clearly different types of people studying the Dharma, people who learn wholeheartedly and some people who are learning for the benefit of themselves in order to get a job in the future. And some people are in the middle. So there are different types of people. VD: It is very difficult for us to live a simple life. I see you are like a Kadampa geshe, how can we try to live a little like that? KJT: I think it would be difficult in the West to try to be like a Kadampa, to do like the kadampa tradition. Not just only because there are a lot of distractions from outside, but also the mind is the most difficult to control. Holding the mind and trying to be like the Kadampa tradition is not so easy because it means the person is capable of not letting ignorance take power over him, not surrender to the ignorance. So, a little bit difficult. VD: Meditation is not always happy. It takes a lot of effort and there is craving to go do activities – how can one cut that, this not being happy while sitting? KJT: To be happy in meditation means having reached single-pointedness. To get this single-pointedness, to reach it, you have to work a lot. Generally people have a lot of distractions and there is also the power or the influence of the ignorance. Of course, during the first stage is not easy to have joyful meditation. VD: And when we will get calm abiding, when is the moment to go for that? KJT: All these things will be happen after a lot of effort. Effort means that there is a lot of struggling. It is not something that you will get without struggling, without effort. This joyful state will not come just like throwing one cat out from a house; it is not that easy because you will have to struggle and apply a lot of effort always, everyday. After that you will get calm abiding. VD: Is it good to practice calm abiding together with tantra? KJT: There are different methods depending on different capacities. Some people are good doing it with tantra, but generally it is advisable to start your basic calm abiding with objects of observation, like an image of Buddha. VD: Will your teacher tell you when to go for it? KJT: Generally, you will have to get information from other sources. Do not think there is always somebody available in front of you to teach – you should try yourself. VD: How would you explain this emptiness we are studying? How does it feel, what is it? Is it like a kind of place where everything changes and one has a kind of freedom? What is the experience of someone who knows emptiness? KJT: Just by understanding, just knowing that emptiness has so many subtleties. A person who understands emptiness has clear in mind the way, where he wants to go. Maybe you rejoice after seeing all the texts, scriptures and so many sutras. Then you rejoice that at least you understand the core meaning of the sutra. Maybe for this reason you might get some kind of rejoicing feeling, but there is not pervasion that you feel certain state of happiness. This is just talking in terms of subtle feeling. Just knowing emptiness is not enough to get that kind of feeling easily. VD: And the experience of great love, how is it? How can we have a taste from it? KJT: This we can prove by just seeing His Holiness the Dalai Lama, without reasons. Maybe you didn’t know His Holiness before, but just by staying near him you feel some kind of peace, trust, love and more tranquillity, this is the power of compassion. VD: When looking back on your life, how do you think it has been? KJT: There is not much to think about. Also I do not having so much of a vivid feeling that “I did this, I did that in the past…” It seems more like somebody just flowing, not having an idea of what he did previously, just flowing with the time. VD: And in the West, what is your feeling, travelling from one center to another, knowing many people? KJT: Generally, I keep in mind to try as much as possible to teach to Western people the profound meaning of the sutras and in order to do that, I trying to put in as much effort as possible from my side to be able to teach meaningfully. This is what in this moment I have in my mind. VD: If you had to give one piece of advice, what is the most important thing? KJT: The only advice I could give is that the person should take ethics and truth as principles. And then try to stay in peace as much as possible. VD: Gesh-la, please, always take care of us, will you? KJT: Yes, yes … So, are you learning well these days? VD: I am very lazy, but I think something is coming. KJT: Sometimes it happens – feeling lazy, to feel that you cannot do this or that. But it is not something permanent; it is something to be changed. So, just try to do your best, make effort, and by effort you will get near the perfection.